Check out this great historic home at the foot of Nanny Goat HIll. 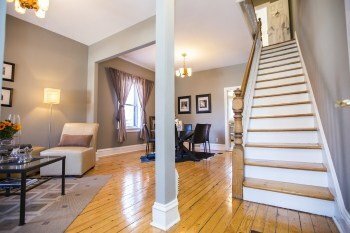 Amazing location on the edge of downtown, within a quick walk of the Ottawa River, Downtown, Chinatown, Little Italy and Hintonburg. Actually considered a Walker’s Paradise by Walkscore.com with a walkscore of 95 out of a possible 100! Check out the interactive map below to see what’s around you! Click here to view the Photo Gallery or click on the Youtube Video below! For more specific details on the property such as taxes and room sizes, click on the attachment below. This few blocks has also been designated a City of Ottawa Historic District at it’s one of the last remaining examples in Lebreton Flats of the houses that were rebuilt after the Great Ottawa Fire of 1900. Naturally they were built in brick! The designation means the look of the neighbourhood will stay largely the same and also the City of Ottawa may match funds up to $5000 per year for any exterior renovations! Retaining all the charm and character with great updates to keep you in the comforts of today! Own a piece of Canada’s history and enjoy the wonderful benefits of this very walkable neighbourhood! Features 3 bedrooms on the second floor, living room, diningroom and eat-in kitchen on the main. The back yard has been beautifully and professionally lanscaped into a stone courtyard with parking for 1 car incorporated into the stone patio. Nicely fenced for a perfect backyard OASIS for entertaining and relaxing on those summer days and nights! An Natural Gas BBQ is also provided so you’ll never run out of fuel. Very nice home quietly located away from traffic but in the centre of everything! Enjoy great pastries from the place across the street with your morning coffee! Call Eric Manherz at 613-601-6404 today to find something wonderful for you! Enjoy the Ottawa Urban Lifestyle with no condo fees! Take a peek at the Youtube video below.